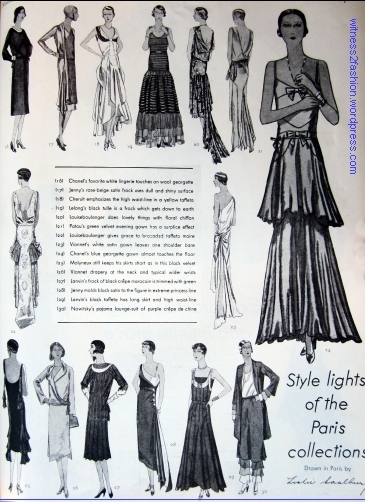 In November 1929, Butterick’s Delineator Magazine ran two full pages of sketches of Paris Fashions — Vionnet, Chanel, Patou, Schiaparelli, Molyneux, and many other top designers, some of whom are no longer very well known. 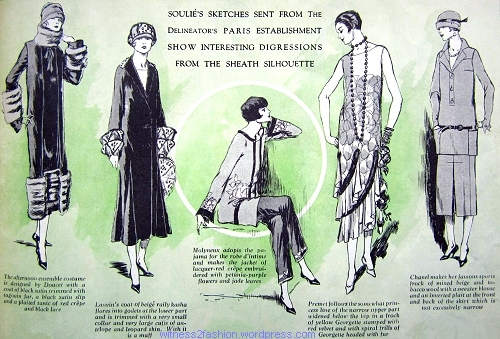 Sketches of Paris fashions, # 1 through 15, Delineator, November 1929. Page 26. In order to make these sketches available for further research, I’ll try to show them one at a time, with their original descriptions from The Delineator. And, because there are thirty sketches in all, I’ll show 15 designs for daytime today, and designs 16 through 30 in Part 2. 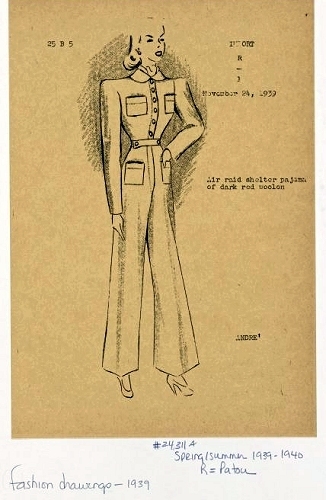 Sketches of couture, # 16 through 30, Delineator, Nov. 1929, page 27. Leslie Saalburg, illustrator. After 1929, hems dropped precipately. Patou claimed the credit, but I won’t pursue that here. 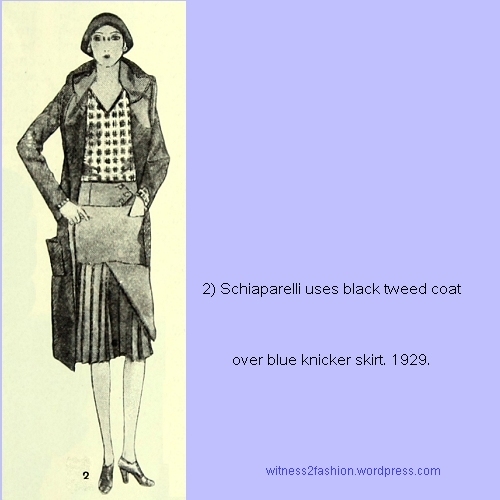 Schiaparelli, who wore culottes in the city in 1935, showed a pleated “knicker” skirt with a covering panel here, in 1929. The sketches are accompanied by the original descriptions. Perhaps you’ll find other surprises…. 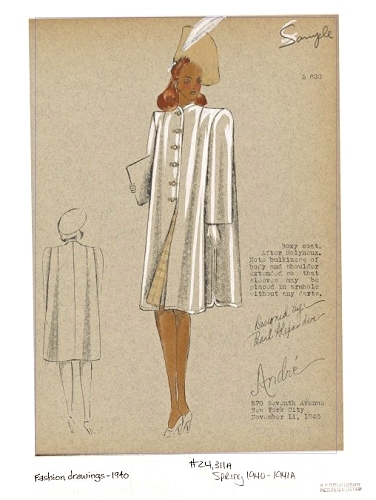 Patou coat and dress, Delineator sketch, Nov. 1929. 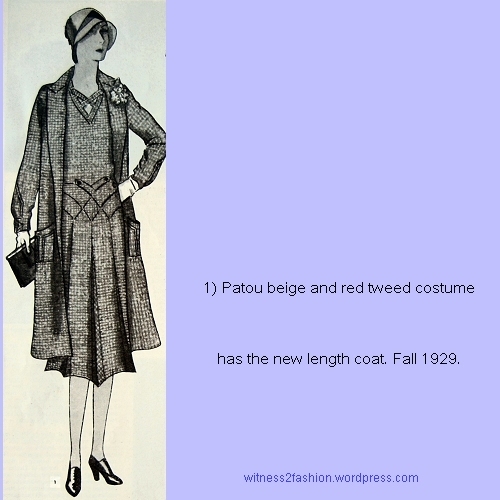 The coat seems to be about the length of the dresses shown by other designers, but it’s hard to tell what is going on with Patou’s pleated skirt. Notice the suggestion of a natural waist, trimmed with buttons. 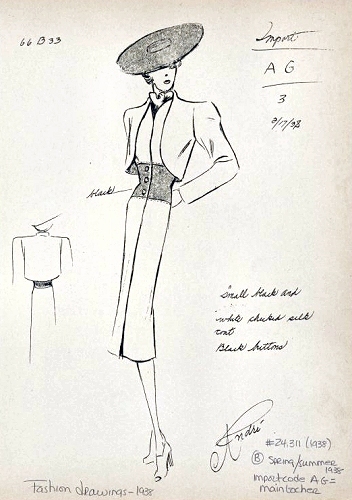 Sketch of Schiaparelli “knicker skirt” in Delineator, Nov. 1929. The illustrator, Leslie Saalburg, seems to have had a little trouble with this one. As we know from Elizabeth Hawes’ Fashion Is Spinach, illustrators had to make furtive notes and then sketch from memory later. 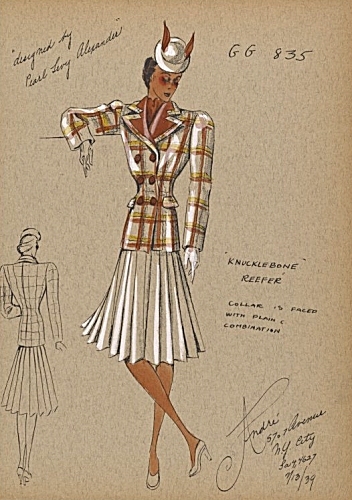 Coat designed by London Trades, Delineator sketch, Nov. 1929. 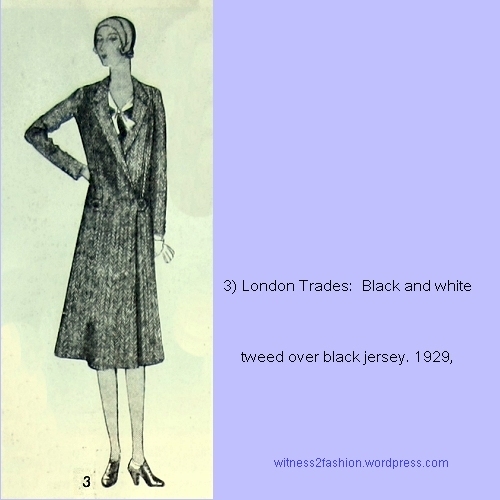 London Trades is one of those designer names, popular in the 1920’s, but rarely mentioned today. 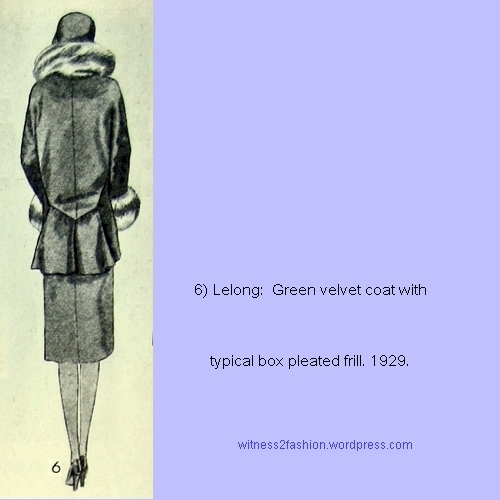 Green cloth coat by Cheruit, sketched for Delineator, Nov. 1929. Note the natural waist on this fitted coat. Mme. Cheruit herself retired in 1914, but the House of Cheruit carried on until 1930. This Cheruit tea-gown from 1922 shows strong influence from The Ballets Russes: Big, bold patterns and brilliant, exotic colors. A caped dress, which looks like a coat, from Molyneux, 1929. Delineator sketch. 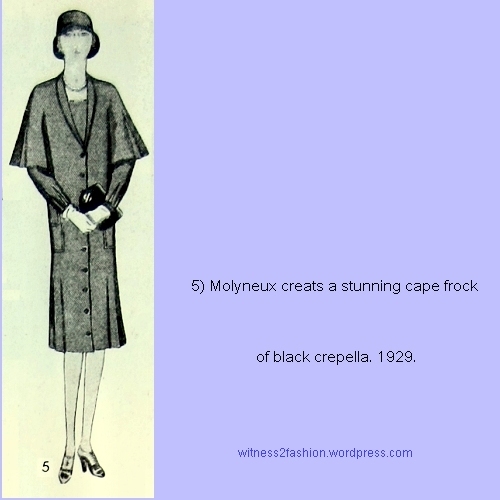 “Captain Molyneux” — he was an Englishman — also produced some spectacular evening wear. 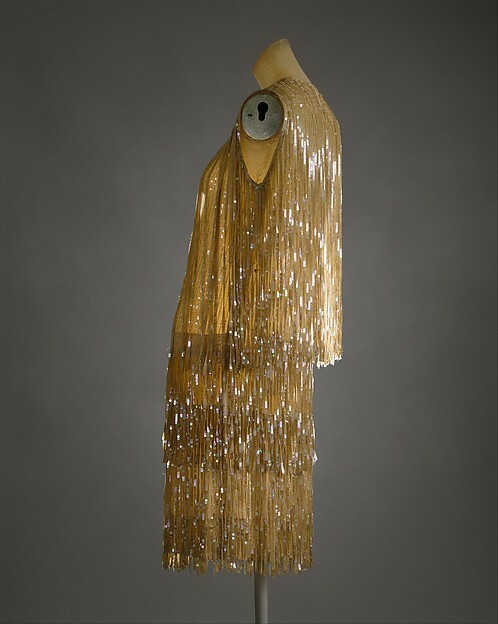 Click here for a glimmering dress from 1926-27. Coat with interesting back detail from Lucien Lelong. Sketched for Delineator Nov. 1929 issue. 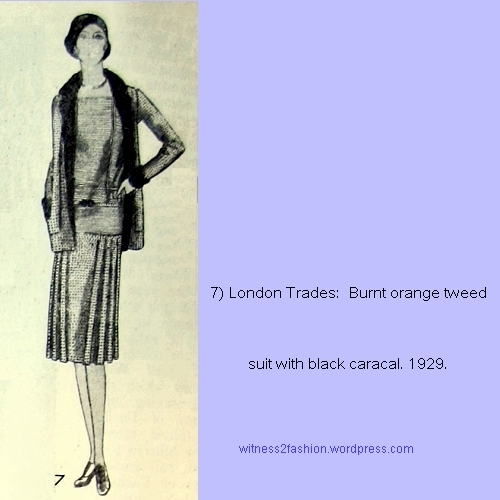 Burnt orange suit from London Trades, 1929. Delineator sketch. A caracal is a lynx-like cat with beautiful tufted ears. See more here. 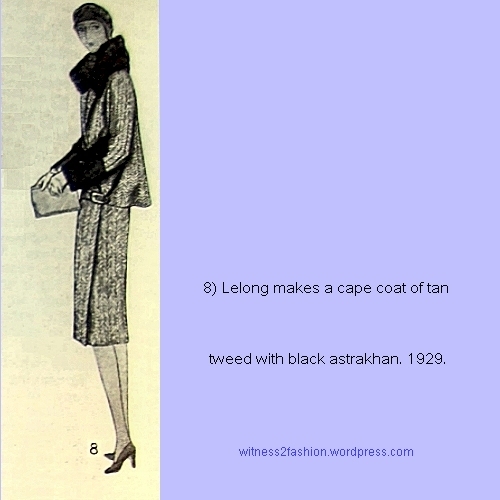 Tweed cape by Lelong. Sketcher for Delineator, Nov. 1929. Astrakhan is a tightly curled fur, a variation on “Persian” lamb. Click here if you need to know more…. A coat and matching “rug” (a small lap blanket for wearing in cold cars, while watching outdoor sports, etc.) 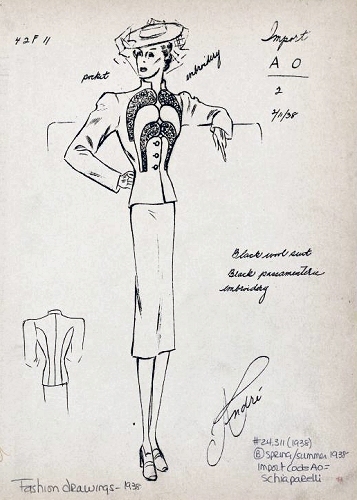 by Elsa Schiaparelli, sketched for Delineator. Nov. 1929. 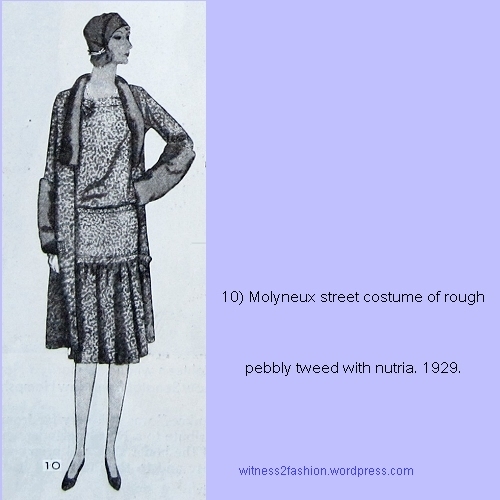 Costume by Molyneux, sketched for Delineator Nov. 1929 issue. Nutria (also called coypu) is a rodent. Raised for fur, some nutria escaped. In 2010, it was being treated as an invasive species in Louisiana. The New York Times explained here. Day dress by Patou, sketched for Delineator, Nov. 1929. Cheviot is a kind of wool. 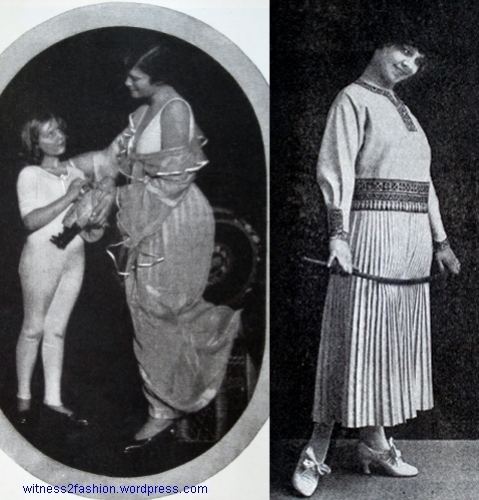 This dress is slightly longer than other dresses of 1929 shown in the same article. Perhaps more interesting is the belt — worn approximately at the natural waist. 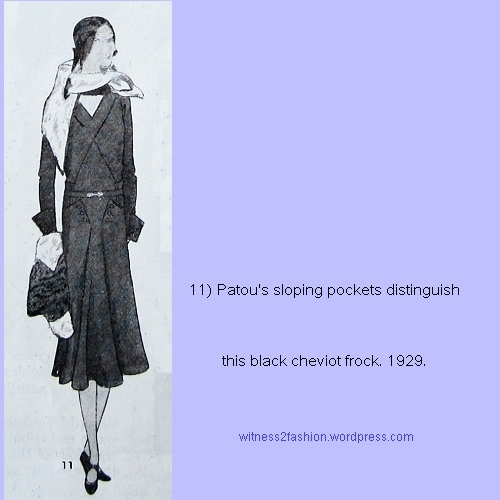 Patou was famous for his sportswear in the 1920’s. You can read about his monogrammed sportswear in this article about the influence of tennis on fashion. 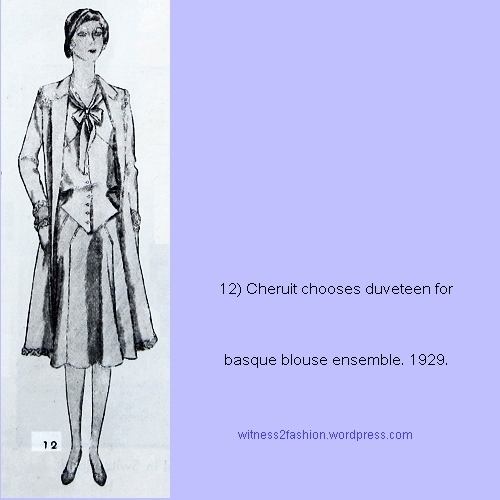 A basque blouse outfit from Cheruit, sketched in 1929. Duveteen was a napped fabric, often suggested for Butterick patterns in the Delineator . 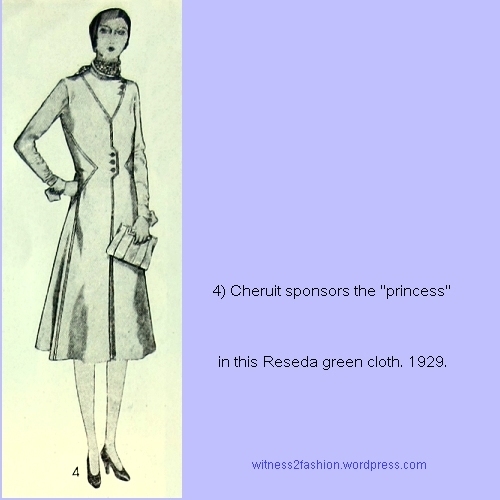 The flared skirt was fairly new, but this Cheruit outfit was soon to be out of style without ever being really in style. 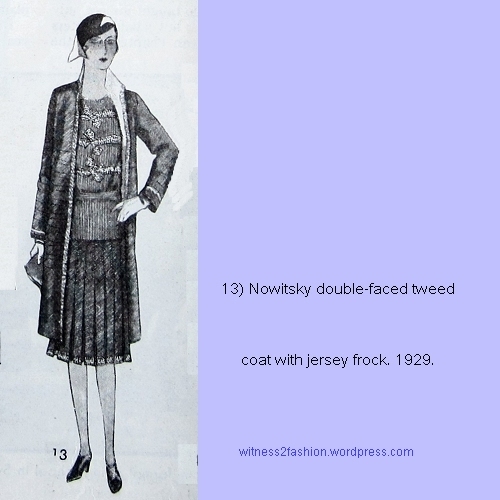 A coat made from double-faced tweed, by Nowitsky; 1929 sketch from Delineator. 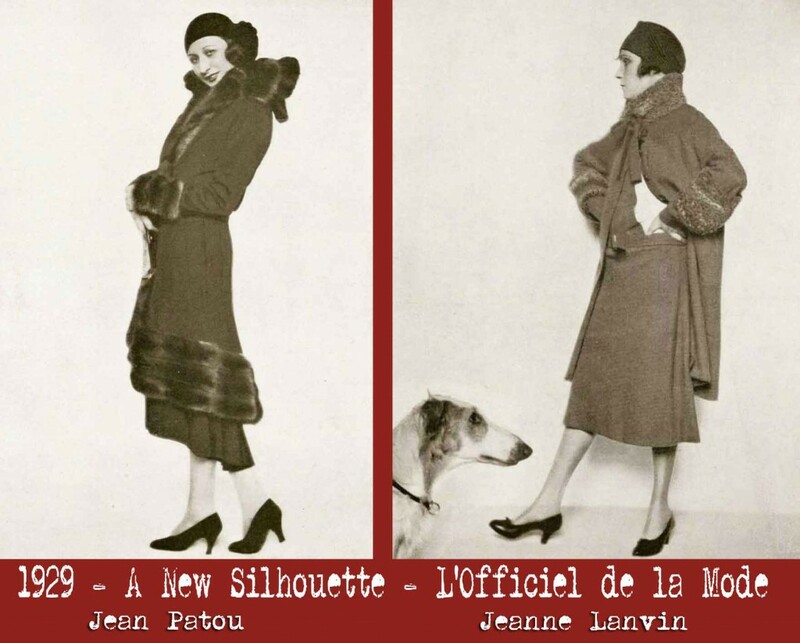 Mary Nowitsky was often mentioned in Delineator’s Paris coverage; I find some of her twenties’ sportswear very attractive. It’s hard to find information about her. 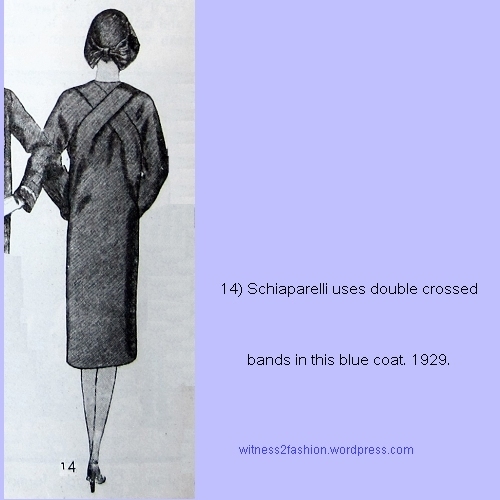 Coat with interesting back by Schiaparelli. Sketched for Delineator, in 1929. 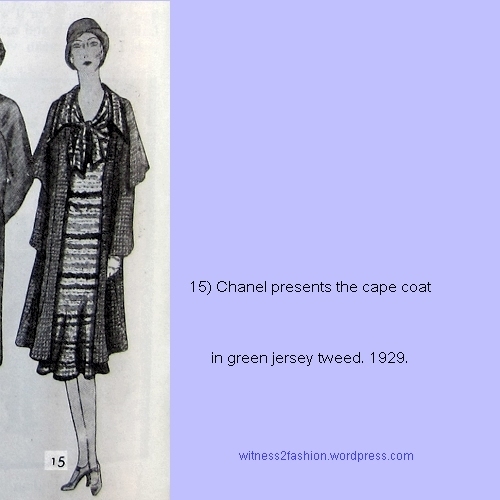 Jersey coat by Chanel, sketched for Delineator in 1929. Chanel’s striped dress anticipates the 1930’s — except in length. 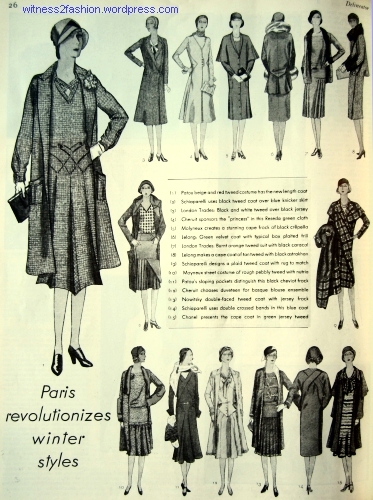 More Chanel in the next post, Part 2 of Paris Fashions from The Delineator, 1929. 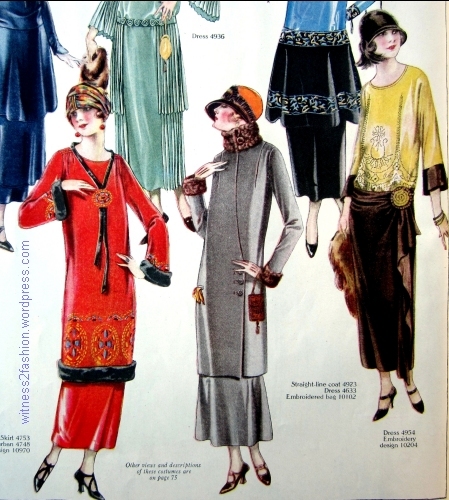 Paris designs, Delineator, January 1925. From Left: Doucet, Lanvin, Molyneux, Premet, Chanel. 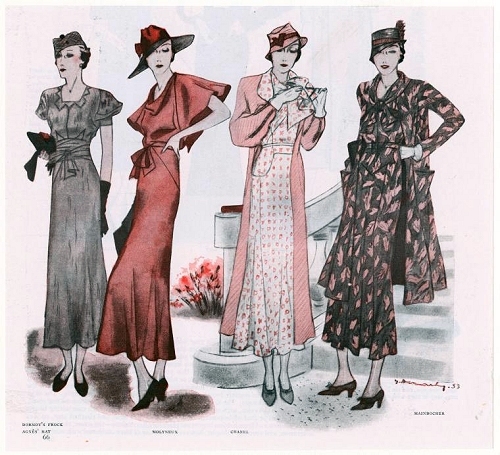 In the July, 1925 issue of Delineator magazine – published by the Butterick Publishing Company — columnist Evelyn Dodge gave the following advice on looking slender while wearing 1920s fashions. I will divide it into three parts — proper corsets, proper lingerie, and proper sizing and styles. 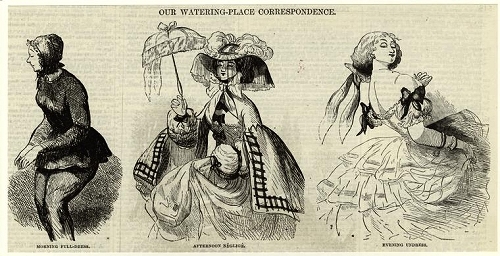 I have already exerpted part of her article in Underpinning the Twenties: Corsets and Corselets. I will add illustrations from Delineator and other sources, and my own comments. 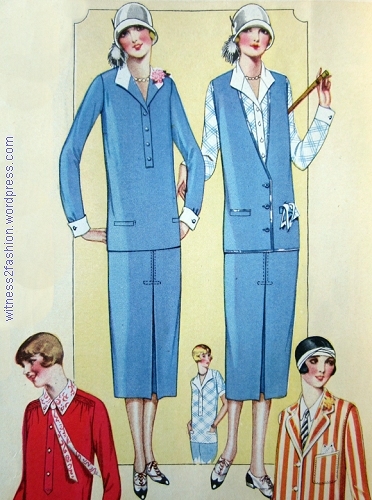 Butterick patterns, June 1925. Delineator. Tip Number One: Wear a Corset or a Corselette. Dodge attributed the change in women’s figures to the relatively shapeless styles of the preceding decade. Three outfits from the Perry, Dame & Co. Catalog, 1917. If you were an actress — whose next job might depend on being shapely — which would you prefer to wear? 1916 designs by Gabrielle Channel [sic] from Doris Langley Moore’s Fashion through Fashion Plates, republished by Quentin Bell in On Human Finery. Then came the 1920s, when the ideal figure was flat in front and flat behind. 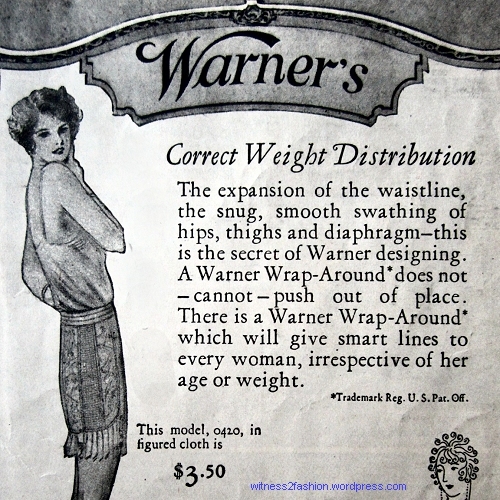 Warner’s corset, March 1925. Delineator. 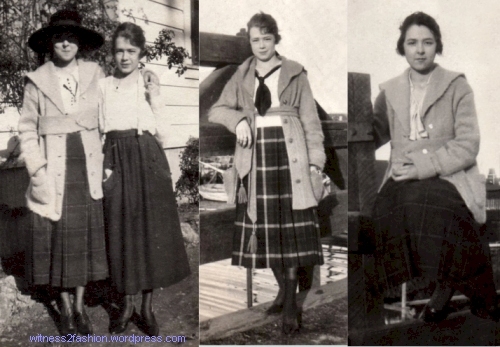 Young Women Wearing Fashionable Sweaters, California, 1917-1918. Note how similar their sweaters are to the ones in the catalogs, below. “A few years ago during the vogue of the sweater with its concealing lines, women took off corsets, drew a long breath and let their figures go. Sweaters from the Perry, Dame & Co. Catalog, 1917. Dover Books. 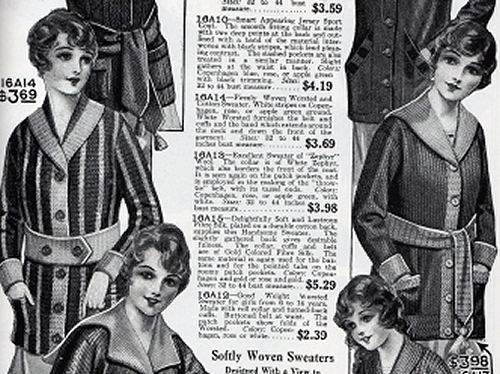 Sweaters from Sears catalog, 1922. 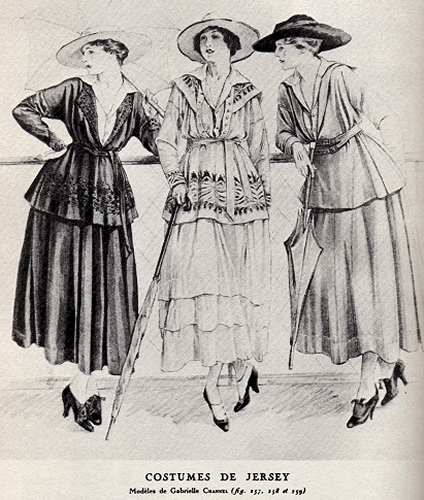 From Everyday Fashions of the Twenties, by Stella Blum. Please do not copy this image. “Some of the results were good, others were bad. The large waist and the resulting lowering of the bust and straightening of the hip has a youthful air. [!] But the diaphragm bulge, the middle-aged spread, the very pronounced increase in weight, have proved ugly and stubborn. Models Photographed for Ads in Delineator, 1917. Their figures would be out of fashion in the nineteen twenties. Imagine the woman on the left in a 1920s dress. Bon Ton Corset Ad in Delineator. April 1925. The Modart Corset company ran a series of “X-ray vision” ads showing corsets as worn under clothes. 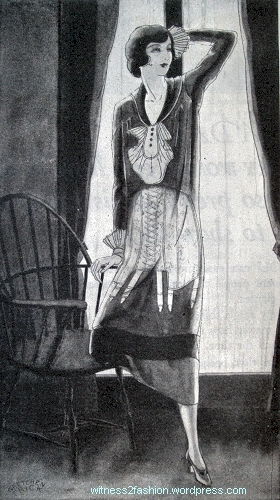 Young woman wearing a Modart Corset under her dress. October 1924, Delineator. 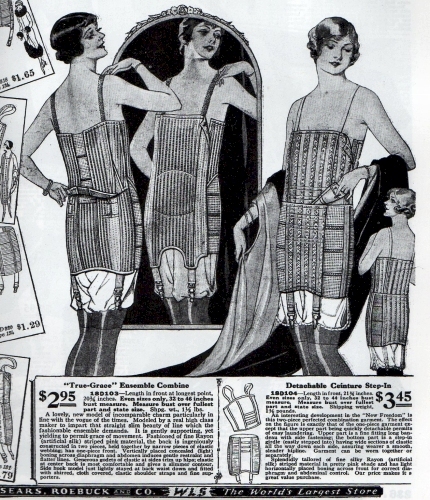 Corsets from Sears catalog, 1925-26. From Everyday Fashions of the Twenties, by Stella Blum. Please do not copy this image. 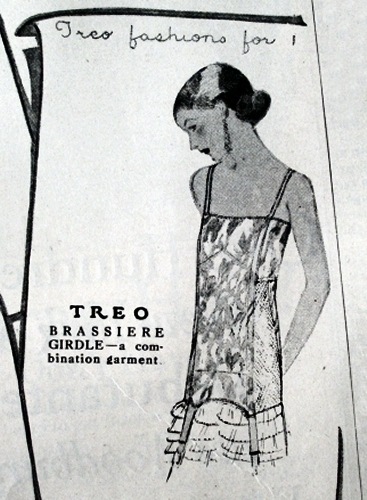 Treo “Brassiere Girdle combination garment” ad from Delineator, May 1925. This could also be called a corselette or corsette. 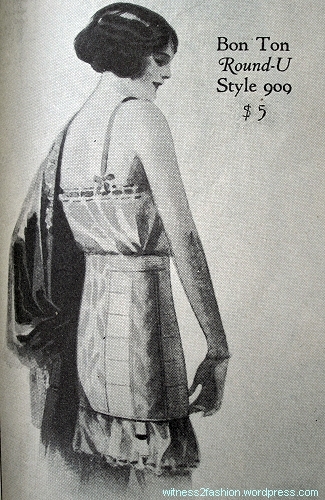 Butterick corselette pattern #5691, January 1925. 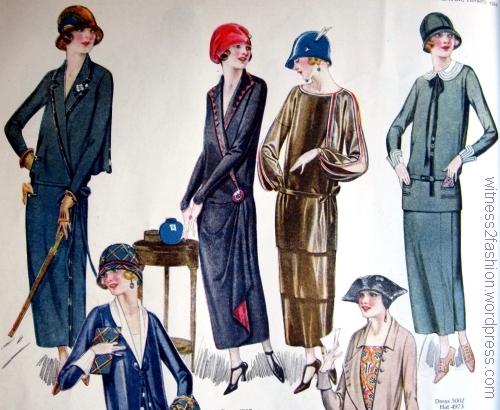 It’s easy to forget that the decade known as The Twenties saw considerable changes in fashion. The period of ‘bound breasts’ and cylindrical figures was ending by 1925. 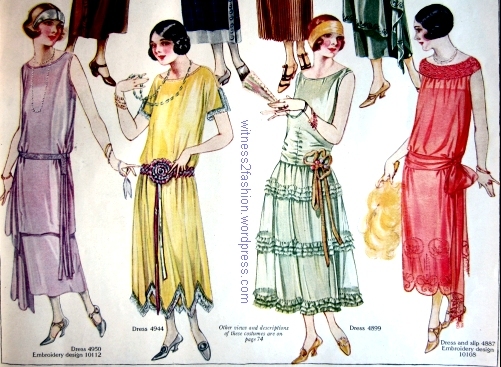 I think of the early 1920s as the ‘tubular twenties.’ The long, tubular dress pattern on the left, illustrated in Delineator in December, 1924 is closely related to this actual beaded dress from a private collection. 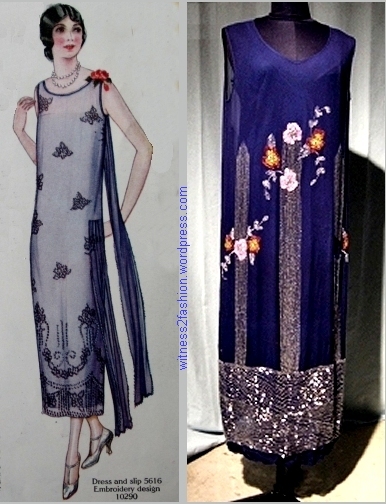 A Butterick dress pattern from December 1924, and a vintage beaded dress from the same period. Both dresses are very long, and hang straight from the shoulders; the concentration of beading near the hem weights the dress. 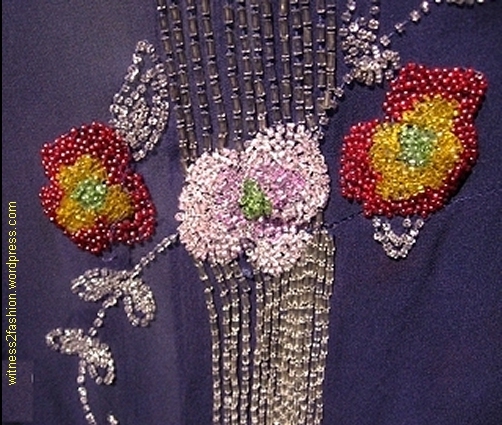 Details of the beading on the front of the dress. This beading was probably done in China, for export. 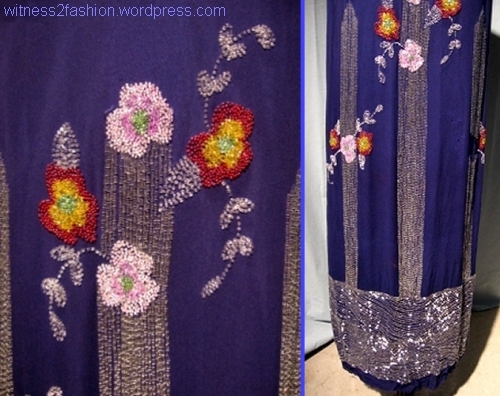 The back of the chiffon dress was also beaded, so it was relatively heavy and fell without curves. Other designs from 1924 show the same long, cylindrical shape, with style variations. 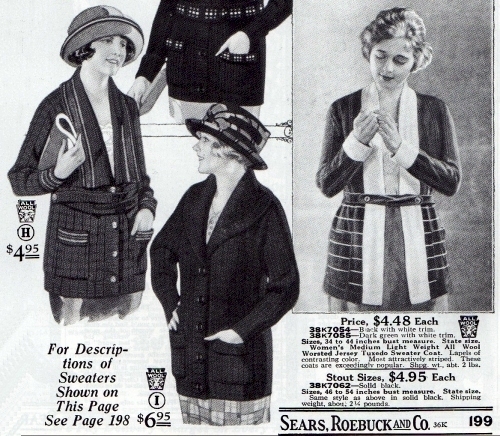 Butterick patterns for January, 1924, from Delineator magazine, p. 38. More Butterick patterns for women, January 1924; Delineator, p.38. 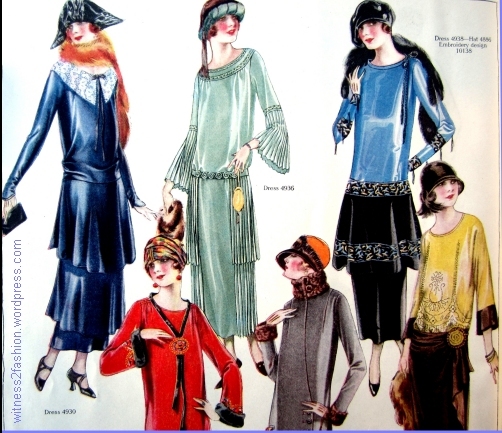 Many fashion trends associated with the later 1920s are visible: embroidery, a cloche hat, some dropped waists, side panels, etc. But these dresses are actually longer than the dresses of the World War I era, and they share the peculiarly low bust of that period. The styles above are for adult women. Patterns for teens, then called ‘misses’ and sold by age (“size 15 to 20 years, or small ladies”) show the same tubular shape and low bust, but are slightly shorter. 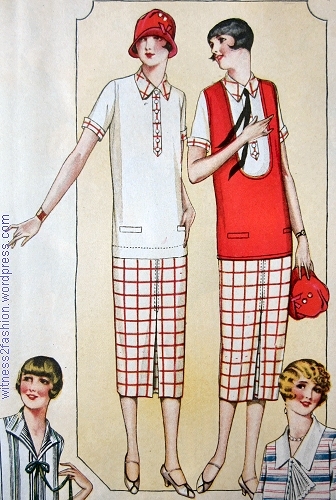 Butterick patterns for misses, Delineator, January 1924, p. 37. Evening dresses for misses and small ladies, January 1924, Delineator, p. 37. 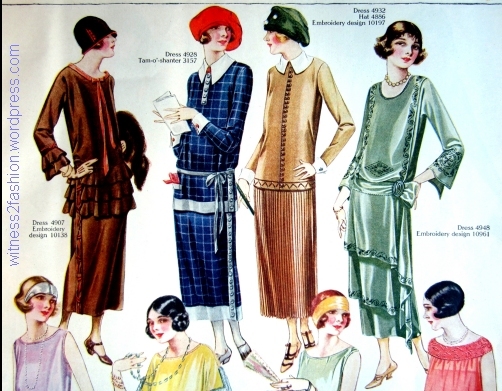 Styles from Delineator, February 1924, p. 30. 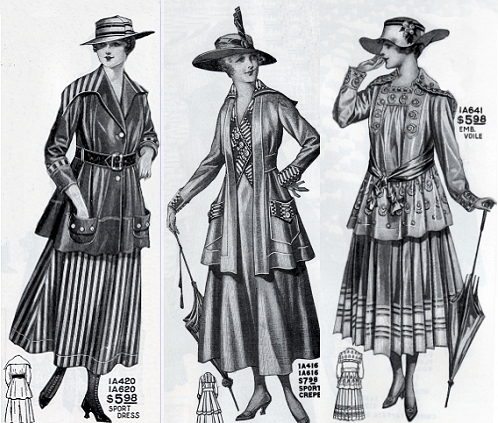 The surplice line dresses on the left remained popular throughout the twenties, as did cloches and tam-o’shanter hats. The blue dress on the right — shortened and with a slight change in proportions — became a classic style for the rest of the decade. Below: This is how Chanel interpreted it in January, 1925. Note the change in length, the bust dart, and the natural bustline. The flattened chest was going out of fashion. 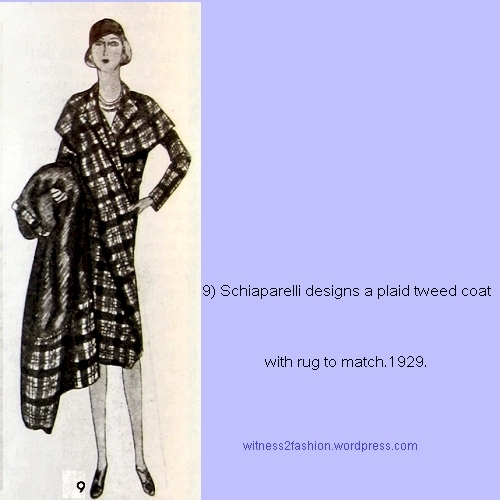 Chanel design, January 1925, as sketched by Soulie in Delineator.